This is a crib sized baby blanket with a patchwork apparence. The sample is Caron Simply Soft which is a soft worsted weight yarn. There are three different types of squares. Make four of each type. The train track square requires two colors. The other two squares can be made in solid colors, but can be different colors from the train track square. I assembled the blanket with the same color as the track color, but any color can be used. Each of the square types has a special stitch which is described at the beginning of each of their instructions. 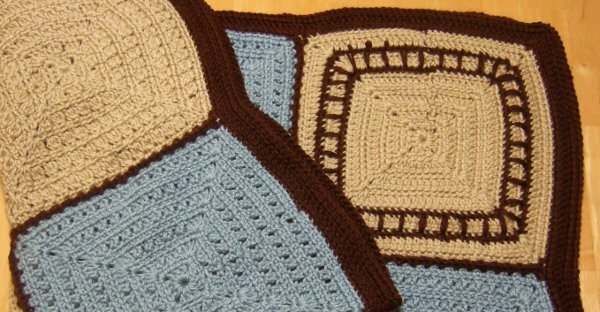 Each of the squares are alternating rounds of single crochet and double crochet or double crochet type stitches. On all rounds, the corners are a single chain stitch. The corners on the double crochet rounds consist on making a (2dc, 1ch, 2dc) cluster in this corner chain space. Take particular care on the next stitch after the corner to find the true next sc. It tends to get buried under that cluster, so you may have to pull the cluster back a bit to get into that stitch. Unless otherwise indicated, crochet in the back loop only. Ldc – yo, insert hook in sc or chain space below the dc of the previous row, yo and pull up a loop even with last stitch made, (yo and draw through 2 loops) twice. Ch4. Sl st in first chain to form ring. Rnd 1: Ch3 (counts as a dc), 2dc in ring, (ch1, 3dc in ring) three times, ch1, sl st in top chain of 3ch. Rnd 2: Ch1, sc in same stitch as sl st, sc in next two dc, [ (sc, ch1, sc) in ch sp, sc in next 3 dc ] three times, (sc, ch1, sc) in ch sp, sl st in first sc. Rnd 3: Ch3 (counts as a dc), dc in next 3 sc, [ (2dc, ch1, 2dc) in ch sp, dc in next 5 sc ] three times, (2dc, ch1, 2dc) in ch sp, dc in next sc, sl st in top chain of 3ch. Rnd 4: Ch1, sc in same stitch as sl st, sc in next 5 dc, [ (sc, ch1, sc) in ch sp, sc in next 9 dc ] three times, (sc, ch1, sc) in ch sp, sc in next 3 dc, sl st in first sc. Rnd 5: Ch3 (counts as a dc), dc in next 6 sc, [ (2dc, ch1, 2dc) in ch sp, dc in next 11 sc ] three times, (2dc, ch1, 2dc) in ch sp, dc in next 4 sc, sl st in top chain of 3ch. Rnd 6: Ch1, sc in same stitch as sl st, sc in next 8 dc, [ (sc, ch1, sc) in ch sp, sc in next 15 dc ] three times, (sc, ch1, sc) in ch sp, sc in next 6 dc, sl st in first sc. Rnd 7: Ch3 (counts as a dc), dc in next 9 sc, [ (2dc, ch1, 2dc) in ch sp, dc in next 17 sc ] three times, (2dc, ch1, 2dc) in ch sp, dc in next 7 sc, change to track color, sl st in top chain of 3ch. Rnd 8: Ch1, sc in same stitch as sl st, sc in next 11 dc, [ (sc, ch1, sc) in ch sp, sc in next 21 dc ] three times, (sc, ch1, sc) in ch sp, sc in next 9 dc, change to main color, sl st in first sc. Rnd 9: Ch3 (counts as a dc), dc in next 12 sc, [ (2dc, ch1, 2dc) in ch sp, dc in next 23 sc ] three times, (2dc, ch1, 2dc) in ch sp, dc in next 10 sc, change to track color, sl st in top chain of 3ch. Rnd 10: Ch1, sc in same stitch as sl st, (ldc in next dc, sc in next 2 dc) four times, ldc in next dc (so that the ldc is in the ch sp of prior sc row), sc in next dc, [ (sc, ch1, sc) in ch sp, sc in next dc, ldc in next dc (so that the ldc is in the ch sp of prior sc row), sc in next 2 dc, (ldc in next dc, sc in next 2 dc) seven times, ldc in next dc (so that the ldc is in the ch sp of prior sc row), sc in next dc ] three times, (sc, ch1, sc) in ch sp, sc in next dc, ldc in next dc (so that the ldc is in the ch sp of prior sc row), sc in next 2 dc, (ldc in next dc, sc in next 2 dc) two times, ldc in next dc, sc in next dc, change to main color, sl st in first sc. Rnd 11: Ch3 (counts as a dc), dc in next 15 sc/ldc, [ (2dc, ch1, 2dc) in ch sp, dc in next 29 sc/ldc ] three times, (2dc, ch1, 2dc) in ch sp, dc in next 13 sc/ldc, sl st in top chain of 3ch. Rnd 12: Ch1, sc in same stitch as sl st, sc in next 17 dc, [ (sc, ch1, sc) in ch sp, sc in next 33 dc ] three times, (sc, ch1, sc) in ch sp, sc in next 15 dc, sl st in first sc, finish off. Rnd 1: Ch3 (counts as a dc), dc in ring, (ch1, 3dc in ring) three times, ch1, dc in ring, sl st in top chain of 3ch. Rnd 2: Ch1, sc in same stitch as sl st, sc in next dc, [ (sc, ch1, sc) in ch sp, sc in next 3 dc ] three times, (sc, ch1, sc) in ch sp, sc in next dc, sl st in first sc. Rnd 3: Ch3 (counts as a dc), cdc in next 2 sc, [ (2dc, ch1, 2dc) in ch sp, cdc in next 2 sc, dc in next sc, cdc in next 2 sc ] three times, (2dc, ch1, 2dc) in ch sp, cdc in next 2sc, sl st in top chain of 3ch. Rnd 4: Ch1, sc in same stitch as sl st, sc in next 4 dc, [ (sc, ch1, sc) in ch sp, sc in next 9 dc ] three times, (sc, ch1, sc) in ch sp, sc in next 4 dc, sl st in first sc. Rnd 5: Ch3 (counts as a dc), cdc in next 4 sc, dc in next sc, [ (2dc, ch1, 2dc) in ch sp, dc in next sc, cdc in next 4 sc, dc in next sc, cdc in next 4 sc, dc in next sc ] three times, (2dc, ch1, 2dc) in ch sp, dc in next sc, cdc in next 4 sc, dc in next sc, sl st in top chain of 3ch. Rnd 6: Ch1, sc in same stitch as sl st, sc in next 7 dc, [ (sc, ch1, sc) in ch sp, sc in next 15 dc ] three times, (sc, ch1, sc) in ch sp, sc in next 7 dc, sl st in first sc. Rnd 7: Ch3 (counts as a dc), cdc in next 8 sc, [ (2dc, ch1, 2dc) in ch sp, cdc in next 8 sc, dc in next sc, cdc in next 8 sc ] three times, (2dc, ch1, 2dc) in ch sp, cdc in next 8 sc, sl st in top chain of 3ch. Rnd 8: Ch1, sc in same stitch as sl st, sc in next 10 dc, [ (sc, ch1, sc) in ch sp, sc in next 21 dc ] three times, (sc, ch1, sc) in ch sp, sc in next 10 dc, sl st in first sc. Rnd 9: Ch3 (counts as a dc), cdc in next 10 sc, dc in next sc, [ (2dc, ch1, 2dc) in ch sp, dc in next sc, cdc in next 10 sc, dc in next sc, cdc in next 10 sc, dc in next sc ] three times, (2dc, ch1, 2dc) in ch sp, dc in next sc, cdc in next 10 sc, dc in next sc, sl st in top chain of 3ch. Rnd 10: Ch1, sc in same stitch as sl st, sc in next 13 dc, [ (sc, ch1, sc) in ch sp, sc in next 27 dc ] three times, (sc, ch1, sc) in ch sp, sc in next 13 dc, sl st in first sc. Rnd 11: Ch3 (counts as a dc), cdc in next 14 sc, [ (2dc, ch1, 2dc) in ch sp, cdc in next 14 sc, dc in next sc, cdc in next 14 sc ] three times, (2dc, ch1, 2dc) in ch sp, cdc in next 4 sc, sl st in top chain of 3ch. Rnd 12: Ch1, sc in same stitch as sl st, sc in next 16 dc, [ (sc, ch1, sc) in ch sp, sc in next 33 dc ] three times, (sc, ch1, sc) in ch sp, sc in next 16 dc, sl st in first sc, finish off. Cluster – (yo, insert hook, draw up a loop, yo, draw through 2 loops) three times in same stitch, yo, draw through 4 loops. Rnd 1: Ch4 (counts as a dc and chain), (3dc in ring, ch1) three times, 2dc in ring, sl st in 3rd chain of 4ch. Rnd 2: Sl st in ch space, ch1, (sc, ch1, sc) in same ch space, [ sc in next 3 dc, (sc, ch1, sc) in ch sp ] three times, sc in next 3 dc , sl st in first sc. Rnd 3: Sl st in ch space, ch3, (1dc, ch1, 2dc) in same ch space, [ dc in next sc, ch1, skip 1 sc, cluster in next sc, ch1, skip 1 sc, dc in next sc, (2dc, ch1, 2dc) in ch sp ] three times, dc in next sc, ch1, skip 1 sc, cluster in next sc, ch1, skip 1 sc, dc in next sc, sl st in top chain of 3ch. Rnd 4: Sl st in next dc, sl st in ch space, ch1, (sc, ch1, sc) in same ch space, [ sc in next 3 dc, sc in ch sp, sc in cluster, sc in ch sp, sc in next 3 dc, (sc, ch1, sc) in ch sp ] three times, sc in next 3 dc, sc in ch sp, sc in cluster, sc in ch sp, sc in next 3 dc , sl st in first sc. Rnd 5: Sl st in ch space, ch3, (1dc, ch1, 2dc) in same ch space, [ ch1, skip 1 sc, (cluster in next sc, ch1, skip 1 sc) five times, (2dc, ch1, 2dc) in ch sp ] three times, ch1, skip 1 sc, (cluster in next sc, ch1, skip 1 sc) five times, sl st in top chain of 3ch. Rnd 6: Sl st in next dc, sl st in ch space, ch1, (sc, ch1, sc) in same ch space, [ sc in next 2 dc, (sc in ch sp, sc in cluster) five times, sc in ch sp, sc in next 2 dc, (sc, ch1, sc) in ch sp ] three times, sc in next 2 dc, (sc in ch sp, sc in cluster) five times, sc in ch sp, sc in next 2 dc , sl st in first sc. Rnd 7: Sl st in ch space, ch3, (1dc, ch1, 2dc) in same ch space, [ dc in next sc, ch1, skip 1 sc, (cluster in next sc, ch1, skip 1 sc) 7 times, dc in next sc, (2dc, ch1, 2dc) in ch sp ] three times, dc in next sc, ch1, skip 1 sc, (cluster in next sc, ch1, skip 1 sc) 7 times, dc in next sc, sl st in top chain of 3ch. Rnd 8: Sl st in next dc, sl st in ch space, ch1, (sc, ch1, sc) in same ch space, [ sc in next 3 dc, (sc in ch sp, sc in cluster) 7 times, sc in ch sp, sc in next 3 dc, (sc, ch1, sc) in ch sp ] three times, sc in next 3 dc, (sc in ch sp, sc in cluster) 7 times, sc in ch sp, sc in next 3 dc , sl st in first sc. Rnd 9: Sl st in ch space, ch3, (1dc, ch1, 2dc) in same ch space, [ ch1, skip 1 sc, (cluster in next sc, ch1, skip 1 sc) 11 times, (2dc, ch1, 2dc) in ch sp ] three times, ch1, skip 1 sc, (cluster in next sc, ch1, skip 1 sc) 11 times, sl st in top chain of 3ch. Rnd 10: Sl st in next dc, sl st in ch space, ch1, (sc, ch1, sc) in same ch space, [ sc in next 2 dc, (sc in ch sp, sc in cluster) 11 times, sc in ch sp, sc in next 2 dc, (sc, ch1, sc) in ch sp ] three times, sc in next 2 dc, (sc in ch sp, sc in cluster) 11 times, sc in ch sp, sc in next 2 dc , sl st in first sc. Rnd 11: Sl st in ch space, ch3, (1dc, ch1, 2dc) in same ch space, [ dc in next sc, ch1, skip 1 sc, (cluster in next sc, ch1, skip 1 sc) 13 times, dc in next sc, (2dc, ch1, 2dc) in ch sp ] three times, dc in next sc, ch1, skip 1 sc, (cluster in next sc, ch1, skip 1 sc) 13 times, dc in next sc, sl st in top chain of 3ch. Rnd 12: Sl st in next dc, sl st in ch space, ch1, (sc, ch1, sc) in same ch space, [ sc in next 3 dc, (sc in ch sp, sc in cluster) 13 times, sc in ch sp, sc in next 3 dc, (sc, ch1, sc) in ch sp ] three times, sc in next 3 dc, (sc in ch sp, sc in cluster) 13 times, sc in ch sp, sc in next 3 dc , sl st in first sc, finish off. Lay out the squares in a three by four grid. The first joining will be first to second row. Keeping the squares in the order you have laid out, put the second row squares back to back with the first row squares, holding up the sides you want to seam with the second row square toward you. 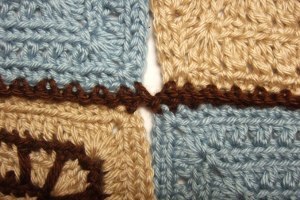 Make all stitches in both loops of the edge of the squares. 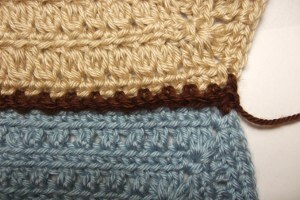 Form a starting loop and make a single crochet in the edge corner chain space of the second row square. Sc in the edge corner chain space of the first row square. Sc in the next sc of the second row square. Skip a stitch on the first row square and sc in the next stitch. Skip a stitch on the second row square and sc in the next stitch. Proceed in this fashion across to the end of those squares, skipping stitches between sc on each square, except at the end to sc in each ch1 space. Then sc in the ch1 space of each of the next two squares keeping with the alternating pattern, then proceed across as with the first squares. Do this again for the third squares. Make this join across each of the rows then again down the two columns. If the border is to be the same color, do not finish off the last one. Rnd 1: On right side, starting from last join row make a single crochet in the ch1 spaces of the adjacent corner. Sc across each edge of each square, and sc in each ch1 corner space. At each seam, sc in the side of the seam. At each outside corner, (1sc, ch1, 1sc) in the corner ch1 space. Continue around the perimeter of the blanket to the beginning and slip stitch in the beginning sc. Rnd 2: Ch3 (counts as a dc), and dc in each sc across each side of the blanket. At each ch1 space on the outside corners, do (2dc, 1ch, 2dc) in the ch1 space. At the end of the round, join with a slip stitch to the third chain of the beginning ch3. Rnd 3: Ch1, sc in same stitch. Sc across each side. At each ch1 space on the corners, do (1sc, 1ch, 1sc) in the ch1 space. At the end of the round, join with a slip stitch to the first sc. Finish off and weave in all ends. cute blanket! I would make little “engines” in blue and tan to applique in the middle of the squares! Great idea and simple too. Little boys are the hardest to make blankets for. Thanks for the pattern! I was thinking the exact same thing! I am just not sure how to get it done. Have you made this or do you know where I might find instructions for “engines”? What a breathe of fresh air! I just found you by accident and I am in love with all the afghans. They are all so simple but unique. This little boy blanket is the bomb! Will make this fro grandson who loves trains!!! As for the train pattern asked for in previous post…. a rectagle for the train, 2 circles for the wheels (with a chain to connect them), and a triangle the the smoke stack. Add a square with a triangle roof for the caboose or added to the engine. How many skeins of each color are needed and what are the colors? I used a little over two skeins of Bone, most of one skein of Chocolate and a little over one skein of Lt Country Blue. 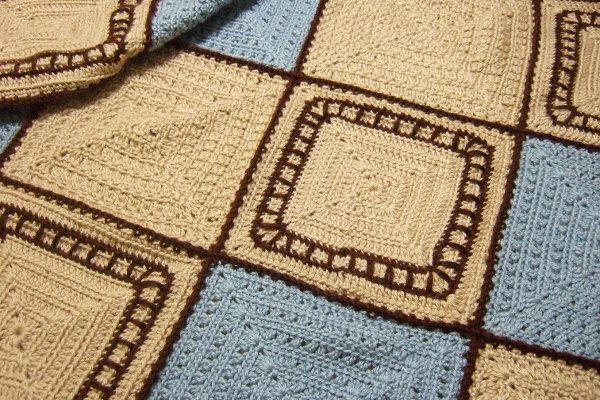 I just love all of your afghans – the patterns and color choices are beautiful. Thank you for sharing. Your webpage is also great – very user friendly and attractive. I love the train build that was suggested with basic shapes! Thank you I will be doing this in black and yellow for a friend that is in a fraternity and known to do the train type step. So excited!!! I tried to keep with the use of ‘back loops’ and using ‘cross double crochet’ as was used in the original pattern…although, because this locomotive is done in rows instead of rounds, some rows will be done in back loops while others will be front loops…depends which direction you’re heading. Let’s give it a whirl…..
row 1 – ch 14, sc in 2nd ch from hook, sc in ea remaining ch, turn. row 2 – ch 1, in front loops only, 13 sc, turn. row 3 – ch 2, in back loops only, 3 cdc, 1 dc, 2 cdc, 1 dc, turn. row 4 – ch 1, in front loops only, 13 sc, turn. row 5 – ch 2, in back loops only, 1 dc, 2 cdc, 2 dc, turn. row 1 – working this row in back loops only, attach yarn with a sl st in 3rd st from left end of the top of the ‘body’, ch 1, sc in same stitch, sc in next st, turn. row 2 – ch 1, 2 sc, turn. row 3 – ch 1, 2 sc in ea sc, fasten off. – again working in 1st ch of starting ch, 3 dc, fasten off. – use the ‘magic circle’ method to create the starting circles, ch 3, 11 dc in circle, pull circle closed, use ‘invisible join’ to make nice round wheels.